THANK YOU TO EVERYONE WHO PARTICIPATED IN THESE EVENTS! THERE WERE A HUGE SUCCESS! KEEP LEARNING, KEEP EDUCATING, KEEP REFORMING! Come join us and Del Bigtree (Producer of Vaxxed: From Coverup to Catastrophe) as we team up with groups from around the nation on United For Medical Freedom Day(s) at the Capitol. We will be rallying on the front steps of the Legislative Building to make ourselves heard: we will not stand by and allow our rights to make health decisions for ourselves and our children to be stripped away! We will educate our elected officials on the current science of vaccines & the current whistle blowers on vaccine fraud. The “Regulatory Vacuum” has left NO ONE, not vaccine makers, not administrating physicians, not lawmakers, responsible for the safety of vaccines. Lawmakers and health officials now find themselves in the very dangerous position of being responsible for any incidence of a vaccine-preventable disease, no matter how minor, while having absolutely no responsibility for the incidence of adverse reaction to vaccines. Parents and concerned citizens MUST SPEAK OUT! Stand up, rise up, be brave and be heard! Bring signs, information, passion and dress accordingly. We hope to see you there! 9:30am Join Del Bigtree, Emmy Award Winning Producer of Vaxxed, and Alan Phillips, vaccine rights attorney and host of Vaccine Agenda Radio at the Phinney Neighborhood Association in Seattle for an enlightening talk about what is happening on a national level regarding vaccine legislation and your rights of exemption. With ever growing evidence as to the fraud and lack of safety and efficacy in the vaccine program as well as increased pressure on states to withdraw personal and religious exemptions, this event could not be more timely or important. 7pm at the University Bookstore in the U-district, James Lyons-Weiler book signing. Current policies & regulations have resulted in widespread underreporting of vaccine injuries. Doctors & Policy Makers have little opportunity to study the consequences of adhering to a one-size-fits-all schedule. This groundbreaking symposium, focusing on the latest science concerning Immunity, Epigenetics, Environmental & Nutritional Factors, and the current absence of Fully Informed Medical Consent, will shed light on the importance of a personalized approach to vaccination and the need for vaccine policy reform. This is an IPAK HOSTED EDUCATIONAL EVENT brought to you by Informed Choice WA. 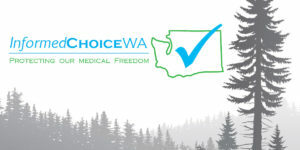 Informed Choice WA is a proud member of the Coalition for Informed Consent (CIC), in support of Physicians for Informed Consent (PIC). James Lyons-Weiler, Ph.D.,Evolutionary Biology, with postdoctoral studies in molecular evolution and functional genomics, will present the results of his review of 2,000 studies on autism, and the findings from IPAKs newest study on aluminum adjuvants–which are staggering. Tetyana Obukhanych, Ph.D., Immunology. Founding Director, Physicians for Informed Consent, will present a scientific framework of the immune system function in anti-viral or anti-microbial defense. Mary Holland, J.D., Research Scholar, NYU School of Law Program Director, will provide the history and current status of informed medical consent in regards to vaccination. Jennifer Margulis, Ph.D., Award-winning science journalist, author, Fulbright grantee will discuss why a personalized approach to vaccination is so critically needed to maximize benefit and minimize individual risk.